Veterans often encounter unique obstacles when considering entering into farming. There are over 800,000 military veterans in New York State, but they exist in a dispersed population, varying from 3-15% of the total population of each county. Because they do not have a dominant presence in any one location, specialized resources are often lacking, ultimately presenting a high barrier to entering agricultural jobs and further marginalizing these veterans. Agriculture is not directly supported by Veterans Affairs – veterans cannot use education funds for most farm training and often cannot use vocational training funds for farm related occupations. In addition, many veterans have unique disabilities (e.g. amputations, PTSD) and training and resources need to include mechanisms to address these issues. Over the last five years, the Northeast Beginning Farmer Program has begun receiving an increasing number of requests each month from veterans seeking assistance. 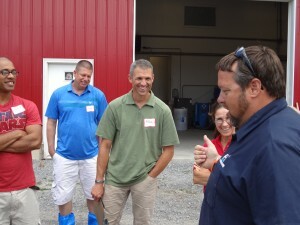 Farm OPS strives to provide access to resources and training events for veterans pursuing careers in agriculture in New York State. With funding from the New York State Department of Agriculture and Markets, and NYS Senate Agriculture Committee, we currently are offering scholarships to veterans and active duty military personnel who attend educational events and workshops. The program currently offers up to $100 in reimbursement on eligible costs for agricultural trainings on a first come, first serve basis, while funds are available. At this time, eligible costs include travel expenses and registration for trainings (i.e. hotel, mileage, event registration). Working with our partners in Cornell Cooperative Extension and other regional leaders, we are helping to cultivate farmer-to-farmer learning groups for veterans to gather, prioritize educational goals, learn from each other, and develop mentoring relationships with other farms and organizations available to support their goals. Here in the Southern Tier we plan to host 4 regional trainings throughout 2018 in the following topic areas: Let's Write Your Business Plan, Growing American Ginseng in the Southern Tier, etc... We are working in partnership with the Small Business Administration, The Vet Center, Southern Tier Veterans Support Group, STOP-DWI, and Assemblywoman Donna Lupardo's office on this initiative. Are you keeping copies of all the receipts and paperwork that you’ll need come tax time? Join Cornell Cooperative Extension of Broome County for our first “Ask the Experts” talk with Grey Bennis, Tax Associate with Farm Credit East. He will discuss typical tax forms that a farm or agribusiness would file, the best ways to keep track of all your receipts, mileage and other important numbers, and best practices for tracking income and expenses. Cost: $15/farm (includes 2 registrations) Veterans are FREE! What are the most effective ways to market your products in the buy local movement? Who are your customers? How do you find out your community demographics to better understand your target customers? Can we compete with larger corporations for space in the marketing realm? Join Cornell Cooperative Extension of Broome County for our second “Ask the Experts” talk with Lindsey Ott, Creative Director with CenterMost Marketing, LLC. She will discuss marketing strategies and tactics, different types of buy local customers and how you can leverage media strategies to make the most of your marketing dollars.